Color: Colour Covers. Black and White interiors. The Avengers were the second superhero team created by Stan Lee and Jack Kirby for the American company Marvel Comics in the early 1960s, following the Fantastic Four. Initially comprised of Thor, the Hulk, Iron Man, Ant Man and the Wasp, soon joined by Captain America, the Avengers soon became a repository for many of “Earth’s Mightiest Heroes” including Hawkeye, the Vision, Quicksilver and the Scarlet Witch, and the Black Knight. After being introduced to the British public in Odhams weekly title Smash!, they joined the Marvel UK line-up in the pages of Mighty World of Marvel before graduating to their own title. They also occasionally appeared in reprint titles from Alan Class Publishing, either with or without Marvel’s authorisation. The Avengers, the third title published by Marvel UK after Mighty World of Marvel and Spider-Man Comics Weekly, was launched on 22nd September 1973, after the characters had been given a brief tryout in the pages of Mighty World of Marvel #46-48. The first two issues carried free gifts; a sheet of rub down transfers and an ‘Avengers Wonder Weapon’, respectively. Early issues featured reprinted adventures of the Avengers themselves plus Marvel’s master of the mystic arts, Doctor Strange, but from issue #28 the title gained a third strip, Master of Kung Fu, and the title was changed to ‘Avengers & Master of Kung Fu’ to reflect this; this was an attempt to cash in on the Kung Fu craze which was then sweeping the country. The MOKF sub-heading was later removed from the cover, but the MOKF strip itself continued for some time, alternating in later issues with the similarly themed Iron Fist. From issue #95, Avengers absorbed the failed Savage Sword of Conan weekly, the title of which was duly added to the masthead. The title was cancelled after issue #147 (14th July 1976) and merged with Mighty World of Marvel, though the Avengers themselves would subsequently have a lengthy career in various Marvel UK titles including MWOM, The Titans and, most notably, long runs in both Super Spider-Man and Marvel Super-Heroes Monthly, as well as appearing in Marvel Super-Heroes Secret Wars (although this last series sadly did not continue the unbroken run of Avengers stories which had continued from their first appearance in MWOM to their last in MSH, almost ten years later). So cool to the see the UK Avengers material. One thing I could never understand though is why the tone guys that worked for Marvel UK overdid it with the muddy dark tones on the early issues. Nonetheless, this stuff is very welcome. Many thanks. Most if not all of these were b&w reprints of the American comics, dark colours like brown and navy blue, tend to just look black when you convert to b&w, hence the overkill of black tones. 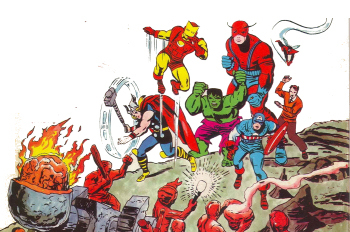 The remaining issues of The Avengers Marvel UK – that is the whole 148 issue run complete. Again, a note of thanks to the original scanners, mostly Jimpy & wolfman for saving these wonderful old comics for future generations.